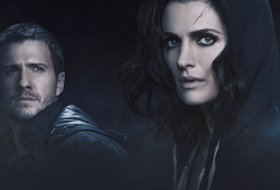 When we read the complete list of Golden Globe nominees this morning, we were shocked — not one Castle nomination! And just off the heels of yesterday’s SAG awards snub. What the heck, right? As much as it pains us to say it, we’re kind of getting used to Castle getting shut out in the Best TV Drama category, which is why we had extra high hopes for some of the other Globe categories — namely Best Actress in a TV Drama. Stana Katic has been on fire this past year! Her performance as Detective Kate Beckett on Castle has touched millions of loyal fans and continues to attract new ones each week. We simply can’t think of anyone else more deserving of a nomination in the Best Actress category. This past year, Stana has proven she has the acting chops to share the spotlight with Hollywood A-lister Nathan Fillion. In Seasons 3 and 4, she took a relatively one-dimensional character and breathed new life into her. We’ve witnessed Detective Kate Beckett transform from closed-off, tightly-wound cop, into an emotional, thoughtful, and complex woman, all thanks to Stana’s talent and dedication to the role. We can pretend like Stana’s striking features and perfect physique have nothing to do with our love for her, but let’s be honest — her beauty is one of the things that makes her so special. Who else can chase murderers through the streets of New York City and look so darn hot while doing it? Plus, when she gives Richard Castle that “I hate you, but secretly love you” look as she bites her lower lip? Yeah, we die. 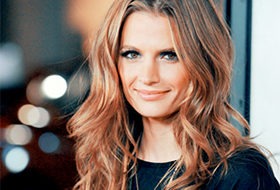 Just ask any one of Stana’s loyal fans — they can’t get enough of the 33-year-old Canadian actress. Her fans hail from all over the world, as Stana herself speaks six different languages. She makes it a priority to connect with her fans online and through her website, something many stars hire a public relations to team to do for them. She answers fan questions on Twitter, posts new pictures on her Facebook page, and even features fan art on her website. We adore Nathan Fillion, and he’s shared the small screen with some great actresses, but with Stana, there’s a palpable chemistry between the two leads, making them TV’s most perfect “will-they-or-won’t-they” couple. But more importantly, she gives Beckett just the right amount of vulnerability, which has made us privy to a part of her character no one else gets to see — the part that’s madly in love with Richard Castle. Two words: Epic. Performance. Clearly, the members of the Hollywood Foreign Press Association didn’t watch this episode.